This Digital Classroom Escape is an interactive activity which promotes peer collaboration and problem solving. Cryptic messages, challenges, and puzzlers combine to create the perfect blend of learning and fun! 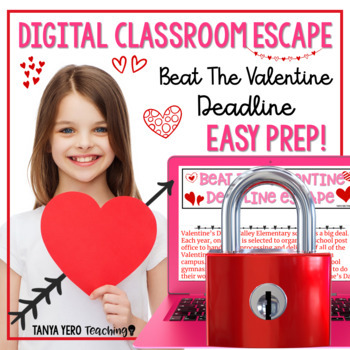 Theme of Escape: Can your students beat the Valentine Deadline in time to make the Valentine's Day party? This Valentine's Day breakout covers the following math skills: area and perimeter, and multi-digit addition, subtraction, multiplication, and division. 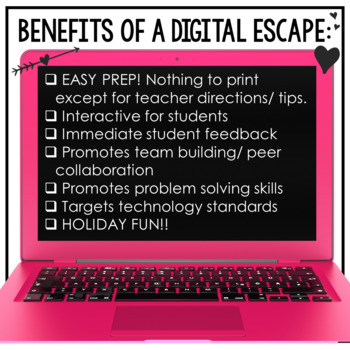 What is a Digital Classroom Escape? A digital classroom escape is an interactive activity in which teams of students use clues to solve challenges and unlock “digital locks.” These activity consists of 4 challenges and puzzlers that students must complete. What do I need to access these escapes? You need access to the internet and technology devices. These escapes work on Chromebooks, iPads, and laptops! 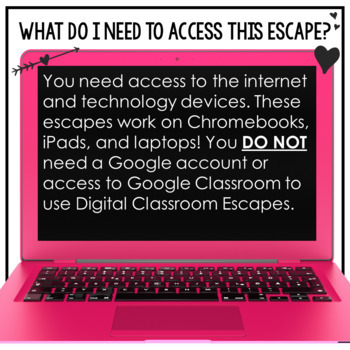 You DO NOT need a Google account or access to Google Classroom to use Digital Classroom Escapes. What do I get with this resource? 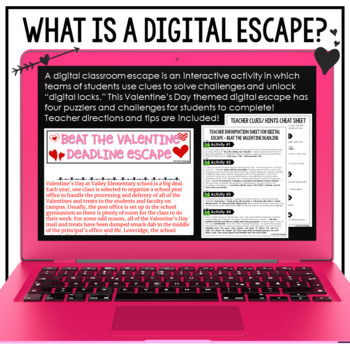 You will get the link to access your Digital Classroom Escape along with DETAILED teacher directions and tips for every step of the activity. Answer keys and suggestive clues are also provided. ➥ EASY PREP! Nothing to print except for teacher directions and tips. !!! TEST TO SEE IF YOUR DISTRICT BLOCKS THIS SITE FIRST! TRY OUR FREEBIE ESCAPE TO ENSURE THAT THE LINK WILL WORK ON YOUR TECH DEVICES. I AM NOT RESPONSIBLE IF YOUR DISTRICT BLOCKS THE WEBSITE. IF YOU GET A 404 ERROR THAT MEANS YOUR DISTRICT HAS IT BLOCKED. YOU CAN EMAIL YOUR DISTRICT WITH THE LINK ASKING FOR PERMISSION. IN MOST CASES I HAVE WORKED WITH THE DISTRIST DOES GRANT PERMISSION. !! !